Well, I couldn’t very well do Modiglioni and not do Picasso. 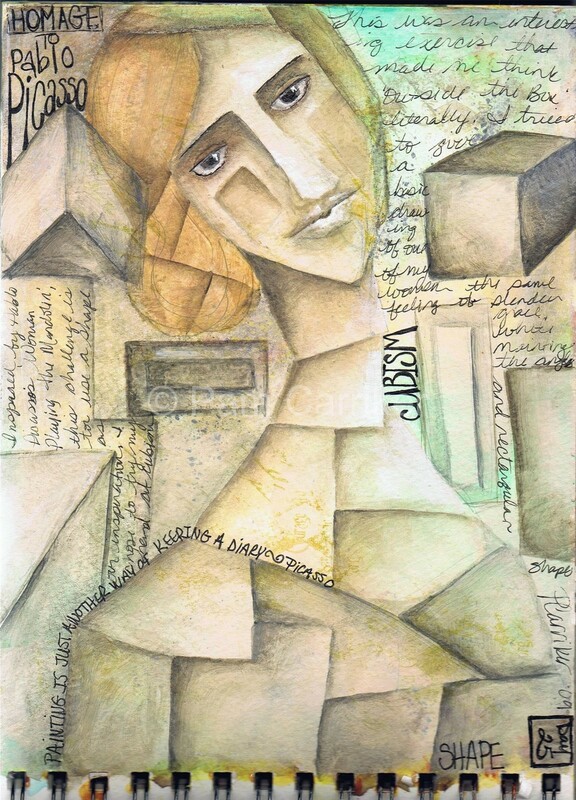 So for my ‘shape’ page, I gave cubism a little try. I have not studied this at all and this is my first attempt, but I do love the look of Picasso’s works in this form. I first did a painted background, then washed it with gesso to give it a muted look. Then I sketched a woman, and portioned her off into blocks. I also added some into the background and then painted them in using various shades of the skin tones I painted her with. I like the overall effect and it it fun to try different things. Oh I love this. Picasso is one of my favorites, as is the cubism style. If I had been afforded the iopportunity to attend art school I would have studied him first and foremost I do believe. And Andy Warhol (where did that come from).I’ve enjoyed viewing your pages. Wonderful stuff. this is so wonderful!! !i have always wanted to create a piece or pieces inspired by cubism, seeing your work inspires me to give it a try soon! love it! Creative moving art. She’s lovely.